Hla Oad is a tiny fishing village at the southern end of the Bitter Coast region, southwest of Balmora on Vvardenfell. It offers few services, and is rumored to be a major stopover for smugglers. There's not much available in the way of services in this small port. A few desolate fisher huts and homes of paupers are centered around a square. Fatleg's Drop Off in town is the location of the local publican, Trasteve, who has a limited supply of weapons, armor, arrows, potions and various sundries for trade. 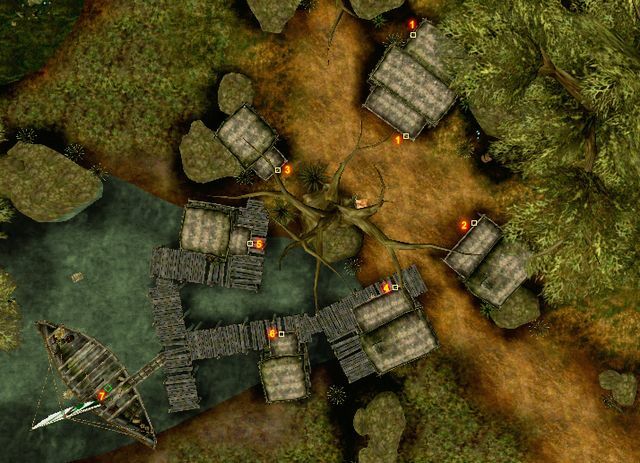 Accessed through a trapdoor from Fatleg's, the Camonna Tong maintains a large smugglers' hideout, right under Hla Oad. You might not be specifically welcome, but they do offer various training and thieves tools. A Khajiit slave carries a special load. Dalam Gavyn offers smith services. Llemisa Marys has a supply of lockpicks and probes for sale, and Perien Aurelie is a pawnbroker. 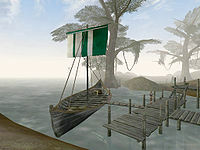 Transportation from Hla Oad to other locations in Vvardenfell is handled by Baleni Salavel, located at the local docks on her transport ship, the Harpy. An uneven path leads north through the swamps to Gnaar Mok. A better path leads east to the Odai River and on to Balmora. The smuggler ship Grytewake is located due southwest. Near Murudius Flaeus's house just above the water level there is a hidden chest. The daedric ruin of Ashurnibibi has Orcs clad in Orcish armor. The Odai Plateau, the location of Rethan Manor, is within walking distance of the village. The necromancer cave of Shal, just north past the ruin, has high quality alchemist apparatus. The Dunmer stronghold Hlormaren offers bandits and access to a Propylon chamber. Restless Spirit: Calm the restless spirit of murdered Julielle Aumine who is haunting Okur in Hla Oad. Ra'Zhid's Dwemer Artifacts: Recover some Dwemer artifacts from Ra'Zhid in Hla Oad. Rabinna's Inner Beauty: Deliver a slave from Relam Arinith in Hla Oad. Fjol the Outlaw: Investigate the reports of an outlaw near town for Larrius Varro at Moonmoth Legion Fort. This page was last modified on 16 November 2018, at 06:29.